Another car show at Momentum of Houston. Can you find the spider? Last edited by haltechsupra; 10-08-2016 at 02:15 PM..
Last edited by haltechsupra; 05-04-2016 at 11:21 PM..
Last edited by haltechsupra; 05-04-2016 at 11:37 PM..
Last edited by haltechsupra; 05-03-2016 at 01:11 AM.. So if there is a fire under the hood you race for your wrench set and start pulling the turbo?! Nah, i reach to the back seat and grab my fire extinguisher. Not supposed to open hoods when a car is on fire because it gives the fire more oxygen. If you have a shut hood, the fire will mostly starve for oxygen and the fire will stall somewhat and give you more time to put it out by spraying under the car to put it out.. Fire safety is an important thing, glad you brought it up.. 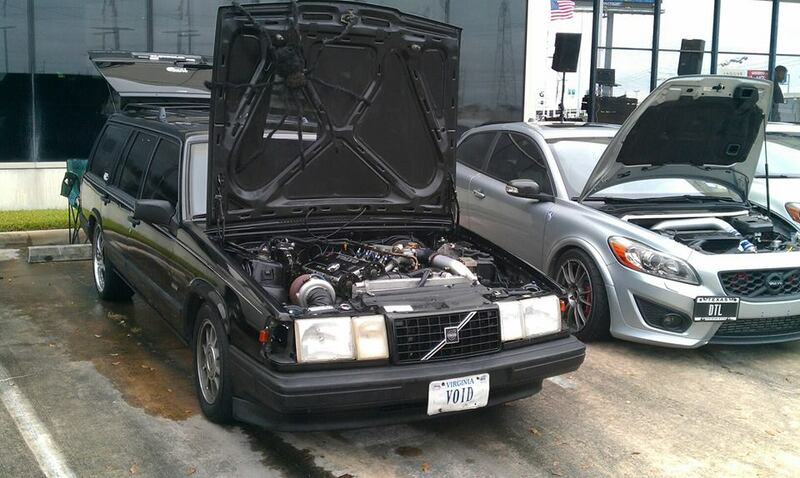 Didn't someone's car burn down at one of the Volvo meets a few years ago? So sad and embarrassing . Pretty sure Brett burned one down a couple of years ago. I had one that caught fire many many years ago, supra injector came off fuel rail. I have carried a fire extinguisher ever since... Had two customers Volvos flood and catch fire for short amount of time,One had bad fuel pressure regulator, other had bad coolant sensor. Didn't hurt anything but some fender paint.. Black widow caught fire once with wrong maf on it . Just on the downpipe with Lh. It only takes two tools and about 15 seconds to open my hood. Last edited by haltechsupra; 05-04-2016 at 11:18 PM..
Peter again talking some trash against one of our buddies. Last edited by haltechsupra; 05-04-2016 at 11:39 PM.. Car show at momentum Volvo . Last edited by haltechsupra; 05-04-2016 at 11:42 PM.. Tick tick tick, ticking time bomb. Last edited by haltechsupra; 05-04-2016 at 11:44 PM..
Last edited by haltechsupra; 05-04-2016 at 11:47 PM..
Last edited by haltechsupra; 05-04-2016 at 11:48 PM..
and at night time, the light bars are a game changer out here..
Last edited by haltechsupra; 05-04-2016 at 11:57 PM..
Watch the boost gauge with vgt, 20psi line lock on stock lh2.4 with tlao chips, can you say spool? No matter what the negative guys say on this forum, these videos show the love For the Black Widow, in a car show full of Ferraris and Lambos, I am surprised we even got noticed.. I was very very surprised how much fun we had. Last edited by haltechsupra; 05-05-2016 at 12:09 AM..
Edit-because of TEXAS240 comment I posted a video of me running a v70 polestar from 65 to 100 , pulled about 3 cars on him(brand new ) on highway but have since removed it, because this comment.... "Are you going to be the one that we see on the news that crashes and kills 5 people in another car for street racing and goes to jail for life in prison?" Last edited by haltechsupra; 10-08-2016 at 02:18 PM.. Reason: edit, stuff has been added back. Last edited by haltechsupra; 05-03-2016 at 01:16 PM..
Me vs polestar , he got the jump. Drivers mod. Are you going to be the one that we see on the news that crashes and kills 5 people in another car for street racing and goes to jail for life in prison? Says the guy waving a baseball bat out the window driving down the road, gtfohwtm. I love how you've lost your **** and are now deleting all of your posts. If you keep driving like that, you are going to delete yourself along with a few pedestrians. Says the guy that has no context or the history of the photo taken.